The first of our new day in Shanghai, my brother and I woke up to have breakfast prepared by my aunt, now that we moved to her place since my uncle and aunt arrived back in Shanghai from Vancouver. My uncle brought us for dim sum lunch at Super Brand Mall which might sound kitsch but it actually is a middle class consumer retail mall with lots of restaurants on the 5th and 6th floor, ranging from fast-foods to abalone and seafood restaurants. Dim sum was delicious and very Hong Kong style, and with that done, we got a lift from my uncle again to the Shanghai Urban Planning Exhibition Hall or 上海城市規劃展示館. For those who have yet to visit Shanghai before, make sure this museum of sorts is in one of your itineraries. This urban development museum showcases the history of Shanghai and has an exhibit of the notable heritage buildings scattered in the city. The highlight of the exhibition, though was on the upper level, with a large scale model of Shanghai with illuminations to showcase day and night. Notable buildings in the city such as the Shanghai World Financial Center and the upcoming Shanghai Center is depicted in Pudong. So are the buildings along the Bund. One can also obtain a ‘bird’s eye view of the city though this diorama from a walkway on the mezzanine floor. On this floor is also a short video clip depicting the urban transformation in the city in its quest to be a livable financial center for Asia and the world. I have visited the exhibition hall once in 2005 and on this second visit, there are several new attractions, including the short video clip and a section where visitors can utilize skills learned in the center on designing their own urban area. This would definitely be a site that kids can gain insight on urban planning as well. Last but not least, visitors should also take the opportunity to take in the view of the adjacent People’s Square and the skyscrapers surrounding it from the top floor of the Exhibition Hall. 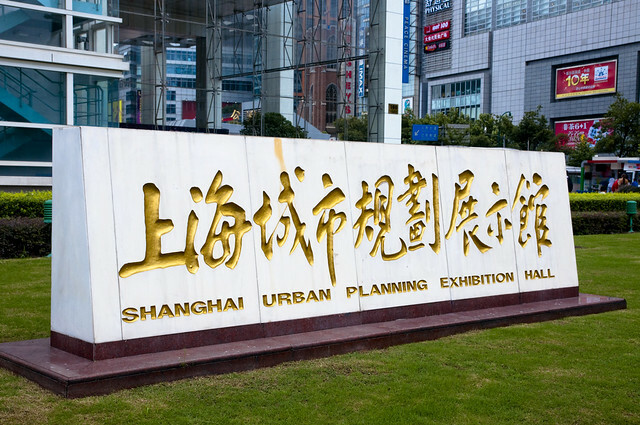 The location of the Shanghai Urban Planning Exhibition Hall right on People’s Square also means it is easily accessible for visitors and tourists can take the chance to visit the Shanghai Museum as well which is just across the street. The large and extensive routes served by the People’s Square Metro Station also meant it can be a major stopover point to reach other parts of the city! From the Shanghai Urban Planning Exhibition Hall, we walked towards Nanjing Road, another mecca for tourist shopping, bypassing Raffles City, a familiar name and mall for people who used to visit Singapore. Many Singaporean franchised stores can be found in this mall! Nanjing The part of Nanjing Rd closer to the Bund is closed to street traffic and strictly pedestrian-only. Having stayed at the Sofitel Hyland in my first visit to Shanghai, this street is pretty familiar and we didn’t explore much before heading on a taxi to go for foot reflexology. Shanghai is a place where one can do their shopping and simply drop by the numerous foot reflexology centres which can easily be spotted with the two words 手足. After the relaxing massage, we returned home for a shower before heading out again to the Shanghai World Financial Center which is currently the tallest building in Shanghai for dinner. We had dinner at a Teppanyaki restaurant which was alright for their pricing before heading to the Lounge at the Park Hyatt for drinks and dessert. Instead of paying 150 Yuan each for the tickets to the 3 storeys of observation deck, my brother and I settled for the slightly lower Lobby Lounge at the Park Hyatt. 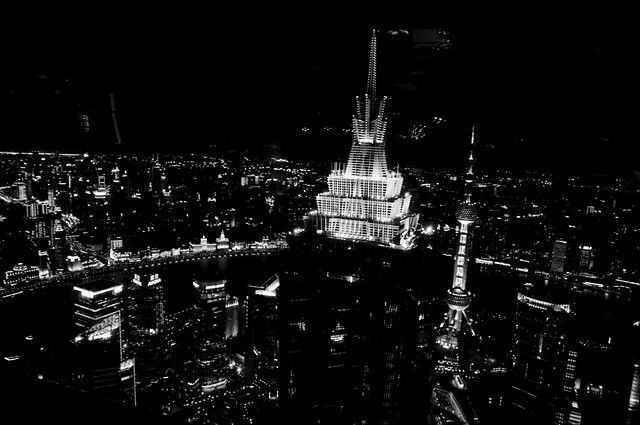 We got a nice seat by the window and it affords one of the best views of the city, with the spire of the Jin Mao Tower, the Oriental Pearl TV Tower and the stretch of the Bund along the Huangpu River. Drinks and desserts for 2 were less than 200 Yuan, though we went on a weekday evening which meant there wasn’t a minimum charge on a per person basis. The next morning, I sent my brother off to Pudong International Airport at T2 for his flight back to Hong Kong, from where he will depart towards Vancouver. It was a clear morning and we had pre-booked a taxi for that morning. 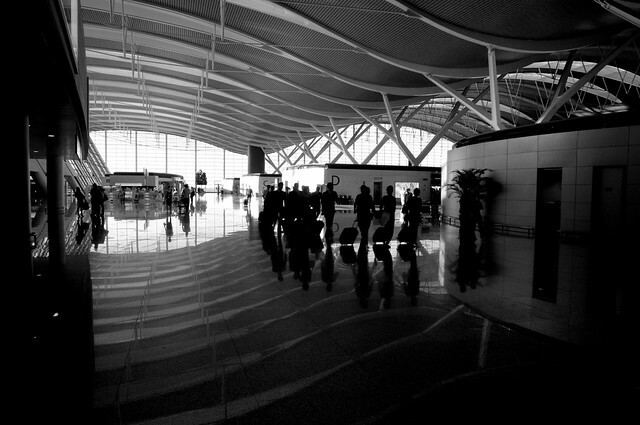 Given the choice I think Hongqiao Airport is a much better choice for an airport after its extensive renovation, since taking the taxi to Pudong seems like a long distance to me. In 2005, I arrived and departed at Pudong’s Terminal 1, though now they had a new Terminal 2 which had much better interiors and reminded me a lot of Changi in their design and functionality. The Cathay Pacific/Dragonair check in was fast and had no one queueing. Either we were too early or there’s less passengers on this day, a different situation from the packed plane for our journey from Hong Kong to Shanghai. There was also a nice view of the tarmac before one passes into immigration and the waiting area. Spotted a nice livery from Air Macau, several Shanghai Airlines and a Star Alliance Asiana aircraft. I returned from Pudong Airport taking the subway, and by that time Shanghai already has a subway line linking the airport to the city. What happens, though is that passengers taking the subway have to stop 5-6 stops after the airport and switch to another train on the same line. It seems that the airport subway is composed of less carriage, which makes sense considering the relatively small amount of passengers on that morning. Interchange on the station was a hassle for me though even though I was travelling without a luggage, and it was a very crowded station at the interchange stop. I exited the stop at Lujiazui, from where I took a walk around the new ifc mall which had Shanghai’s first Apple Store. 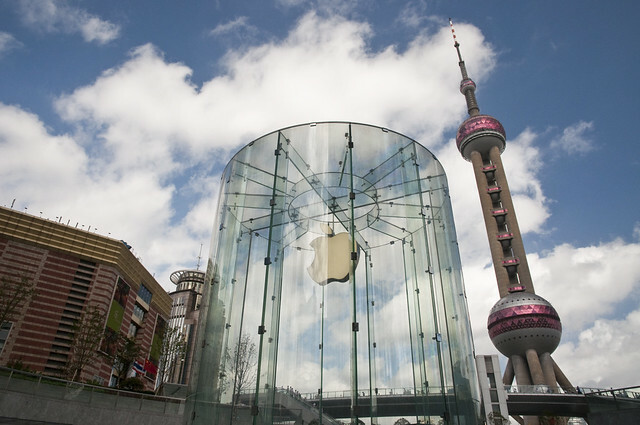 Similar in architecture to the New York Apple Store which had a cube glass foyer, the one in Shanghai has a complementary cylindrical glass foyer with a spiralling staircase which brings customers to a vast store underneath! Since I was still drowsy, I headed back to my uncle’s house for a shower and a short break before heading out again for lunch. 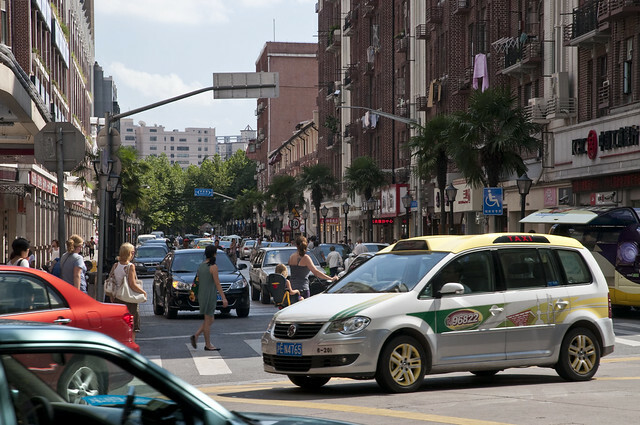 I decided to do some exploring of Shanghai on my own and decided on the French Concession or starting from the main shopping areas of Huaihai Road. Alighting from the taxi close to Xintiandi, I had lunch at Wagas opposite Shui On Plaza before walking along Huaihai Road on the westerly direction. 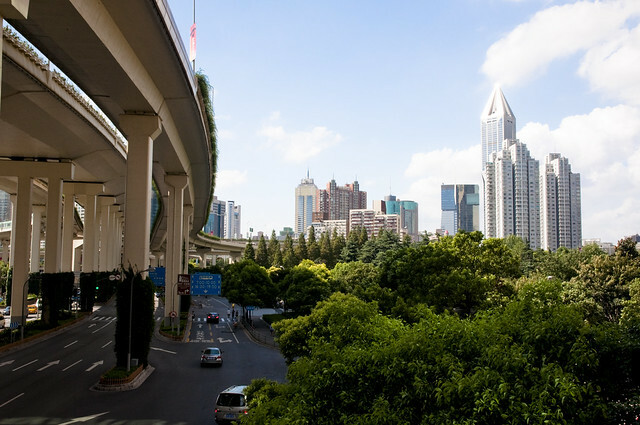 During my walk along Huaihai Road in the initial stretch, I would pass underneath the North-South Elevated Highway 南北高架路. Somehow this elevated highway seems to mark a visual and imaginary boundary. From the large developed skyscrapers and malls, I have entered into a distinctly charming area of Shanghai with low-rise 1920s era building and shopping along the streets. I always do enjoy these kind of shopping to that of malls, as one can enjoy the storefront displays amidst sunshine, trees and the hustle and bustle of the city. Some of these heritage buildings in this area have now been converted into high-end boutiques catering to the wealthy in China and even then, one can still find a small cafe, silk boutiques and pastry shops in between. It was the kind of shopping that reminds me of the Saint-Germain area in Paris. 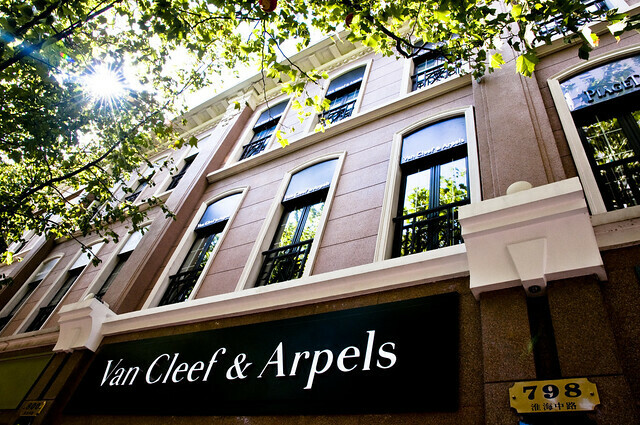 Along Huaihai Road, visitors can make detours to visit sights such as Xintiandi (best visited after sundown), Dr Sun Yat-sen’s former residence, the Soong Family Residence and several other notable villas which have now been restored to become art galleries, museums or civic buildings. I walked all the way until I reached the old Cathay Building. The old Cathay Cinema is one of those art-deco buildings which so famously graced the boulevards of Shanghai in the 1920s, harking back to its prosperous past. I took a cab from this position towards the French Consulate which is a cluster of beautiful villas sheltered under leafy surroundings. This marks the start of the French Concession and used to be the residence of the wealthy and influential in the city during the 1920s. Today, they are used as residences and offices of diplomats. The Shanghai Library can also be found in this area. From here, I took a walk back to the Changshu Road Station and boarded the Shanghai Metro towards People’s Square, and switched subway lines to bring me closer to the Bund or 外灘. Immortalized in the cult movie Shanghai Bund 上海灘, the Bund in Shanghai is a row of colonial-era buildings which marks the days when western influence ruled over much of Shanghai. Today, the red flag of China with its 5 golden stars fly over the top of these buildings, indicating who’s the boss now. 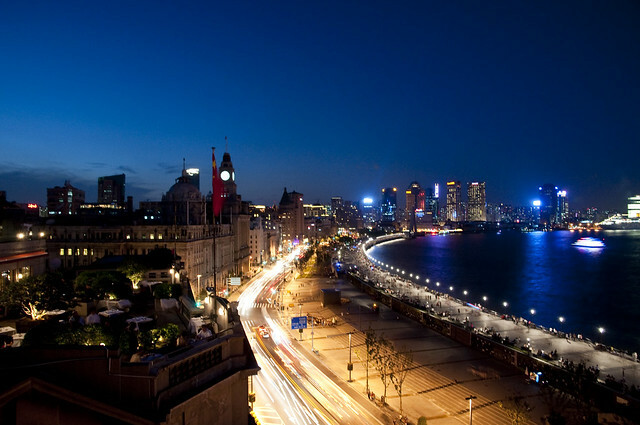 After an extensive renovation work, the Bund in 2010 was much cleaner, tidier and thus brings the whole area back to its glorious past. Three new elite hotels have opened along the Bund, including the Peninsula, Waldorf-Astoria and the legendary Peace Hotel managed by Fairmont. Luxury boutiques and banks grace the lobbies of these former grand buildings, and a raised promenade looks onto the other side of Shanghai with the space-age architecture of Pudong providing an progressive backdrop. If there is any one place to visit in Shanghai, this is it! 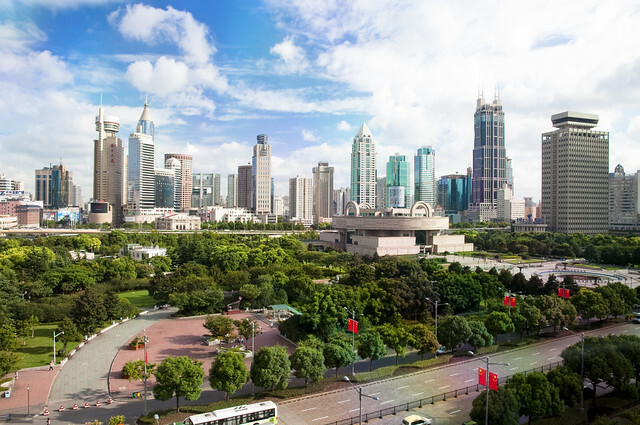 It fully embodies the past and future of the city and shows that the booming times in Shanghai is back. Waterfront housing on Pudong have now reached stratospheric prices of up to 200,000 Yuan per square metre. This is approximately US$ 30,000 per square metre, which might be on par to the cost of penthouses on Manhattan. 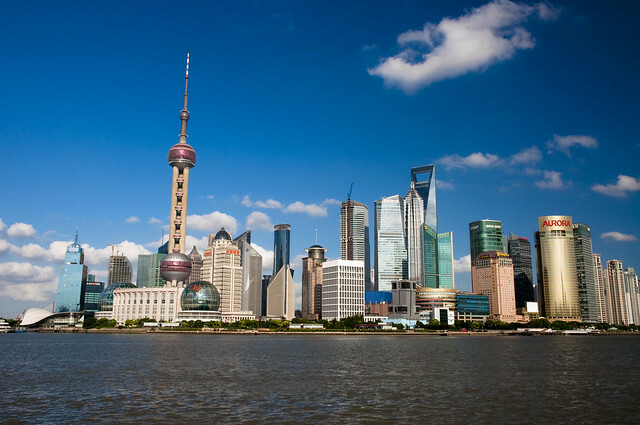 The way I see it, though, is that Shanghai has truly become a city that is desirable to live in with all the modern conveniences and is on its way to become one of the top tier cities in the world along with New York, Paris, Tokyo, London and Hong Kong. I spent the rest of the afternoon walking along the Bund and ending up at the 3 on the Bund for dinner. Rooftop restaurants and bistros have opened on several rooftops of the buildings on the Bund. While the food might be expensive, it is worth it for the views and experience of dining in one of these places. Food at 3 on the Bund is mainly Asian fare with reasonable pricing. Quality of the food is acceptable and I would have to compare the food and price at this dining establishment to be similar in lobby lounges of 5-star hotels. Which means they might not be the best on offer elsewhere, but they are acceptable under the dining ambience. I ordered a bowl of Assam Seafood which comes with a bowl of rice and had orange juice for my beverage. After the short meal, I went around to the bar / lounge section of the restaurant and captured some shots. I guess one of the draws of this place has got to be the view from the rooftop. 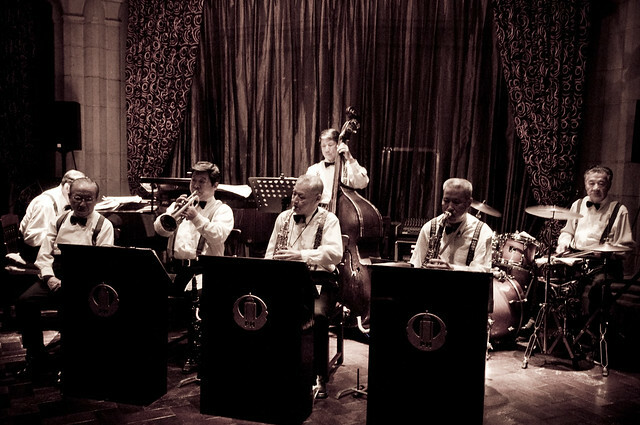 After dinner, I had made a reservation at the Jazz Bar in Fairmont Peace Hotel, since it was considered as classic in one’s tour of Shanghai just as it was to have tea at the Ritz in London (nope, I did not have chance for tea in London at the Ritz). For a Friday night, the receptionist initially said it was impossible to get a seat at the Bar, though when I did mention I am a President’s Club member, she seemed to provide me with a bar seat the next moment. The service at this hotel in my initial impression is of indifference compared to the one I experienced in Fairmont Yangcheng Lake. Maybe it just opened recently, or maybe it is just the people, I wouldn’t know. But they are still much better compared to the cold service in Park Hyatt. There was also a small gallery reminiscing on the hotel’s magnificent past at the hotel which is open to the public. The hotel’s famed Jazz Bar is truly a one-of-a-kind experience. Manned by the classic seniors, the music played by these experienced professionals were really nice. It even attracted a small crowd that night and I could see why it was packed given the relatively small space. A really great night I had which wrapped up my tour of Shanghai alone in a day and allowed me to get a taste of what the Shanghai of the 1920s might have been like – entertainment, shopping, magnificence and grandeur all in this city which has come to retake its crown in the world stage.